Climb aboard our Appledore Star, a two masted 65' shallow drafted bugeye schooner, and sail with us to the mangrove islands and experience snorkeling and kayaking. This tour combines these great activities in Key West so you can don't have to sacrifice anything! Our tour begins with a delicious, freshly prepared breakfast that includes quiche, pastries, fruit, and fruit juices. Then, we will sail to Key West's mangrove islands located in the Key West National Wildlife Refuge. Our Appledore Star is equipped with a bathroom and wide decks for your comfort. Since we only take 16 people per trip, you will have plenty of room to walk around and relax. During the whole trip, be sure to watch for dolphins, manta rays, and sea turtles. Many wildlife call this place home so keep your eyes open as you never know what you will see! Our time there will include snorkeling and kayaking. During the snorkeling part, you will be able to enjoy the warm, calm waters. You may choose to enjoy the tropical fish and wildlife or grab a noodle and float in the water. 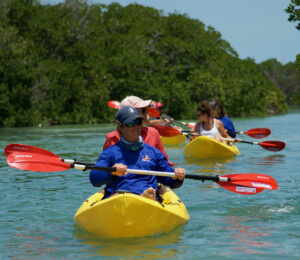 During kayaking, we will guide you throughout the experience and teach you about the mangrove islands. During a typical day, you may see bald eagles, ospreys, and blue herons. After these fun activities, you can cool off onboard with our fresh water rinse. We also have complimentary beer, wine, homemade sangria, water, and soda. Lunch is also served on the boat as well. This lunch buffet includes offerings like shrimp, fried chicken, deli meats, cheese, bread, and salad. After a fun day, enjoy a relaxing sail as you unwind. We also offer an afternoon snack featuring cookies, chips and dip, and fruit. Relax with us on the way back with our delicious sangria as you think abou this memorable day. You will want to bring your own towels, sunscreen, hat, sunglasses, bathing suit, camera and money for souvenirs. What kind of drinks are included? Must show ID/DL before being served any alcoholic beverages. Alcoholic beverages are served only after snorkeling is complete. NOTICE: The discounted prices may not be available during Peak or Holiday periods. Peak/Holiday pricing is $119.95 per adult. I have been to the Bahamas many times, but Bugeye Backcountry Eco Adventure is one of my favorite trips! It includes everything that everyone should do here. As a Bahamas veteran, I can say only the best about this experience!